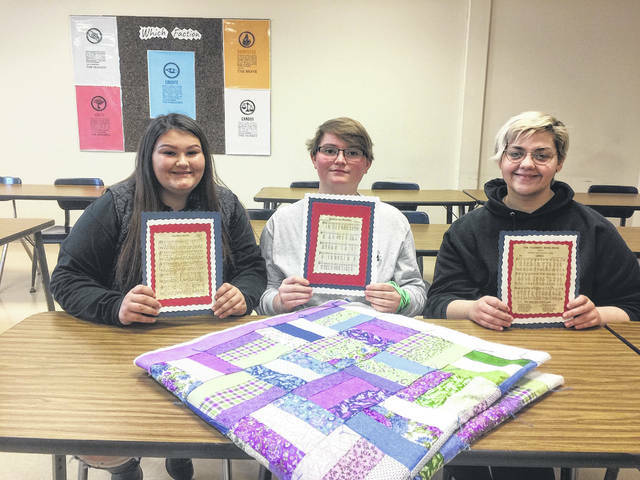 Left to right: Kasey Johnson, Gracey Miller, and Micaela Palmer, the three girls from the SCCTC with their quilt, as part of their competition in the American Spirit Contest in Columbus. Good things are happening with the students at the SCCTC (Scioto County Career and Technical Center). Six of their students are working on projects that they will be presenting at the State Competition in Columbus on April, 16th. Four of these students are from the cosmetology program, one is from the criminal justice program and one is from the masonry program. Kasey Johnson, Gracey Miller, and Micaela Palmer are the first group that is highlighted in today’s article. Johnson is a criminal justice student, Miller is from cosmetology, and Palmer is from masonry. These three girls are going to the state competition for vocational schools in Ohio and are competing in the American Spirit Contest, which is one of the competitions that will be shown on April 16th. The American Spirit Contest is designed to evaluate the local chapter of Skills USA activities in the categories of community service, citizenship projects with patriotic overtones that demonstrate a belief in the American life and finally, projects that promote career education. The students were told to pick three projects that their school has done and then they are to document them. Denise Coldiron, their advisor from the SCCTC, said they then make a notebook that documents everything they have done. And then that has to be publicized. The girls are going to talk about the walk the cosmetologist class is having as part of their competition, then they are working with the honor flight. Their third thing is the sophomore hands-on day, they have already had at the SCCTC. These students are also making quilts, they are working along with the community service class and the Skills USA students, to make lap quilts. As a result of the Human Trafficking walk, that the other group will be doing, this group of students went to visit the women’s shelter and are going to donate the lap quilts to the shelter because they saw the children there and thought it would be nice for them to have. They will have six quilts to donate when they are finished. The three students that are doing this at the state competition were asked by their teachers if they would be willing to do this project and they all volunteered to do so. Their presentation consists of them making the notebook their advisor says will be sent to the judges ahead of time. Then on the day of competition, they will be interviewed and asked questions from a panel of judges. They have to have three categories, one is that of community service. another is patriotism/citizenship and the other one is that of promoting career education. These girls plan to go up to Columbus that night when they return from the honor flight and help them get off the plane, meet them, interact with them and again, thank them. On this particular flight, there will be six WWII veterans, 27 Korean War veterans and 88 Viet Nam veterans. “We worked with our programs and we had all the sophomores come in and we showed them what we did in each program, and how if they come out to the SCCTC what they would be doing,” Miller said about the Hands-on Day. “For example, in the cosmetology demonstration, we had them curl hair, pull hair through the caps and slipper cut on mannequins.” Palmer said that in her masonry group, “we had them lay brick and sling mortar and that one of the girls had white shoes on and got the mortar on her shoe and she was ‘fired up’!” The students stated that they felt the students enjoyed the hands-on day. Palmer said for the third part, the quilting, “The first block students, the second block students are both helping along with two ladies who are teaching us how to do it, since a lot of us, don’t know how to sew.” Jackie Longton and Cathy Bear come to the SCCTC and volunteer two days a week to help the groups. This will all be part of the community service section of the competition in Columbus. The students said they were excited, but a little nervous about their competition. They, along with the group, that is to be highlighted in Thursday’s Daily Times, accompanied by their teachers, will all go up to the Convention Center in Columbus, for the competition. In the part of the competition, the American Spirit Contest, they will be given a specific time to be there. ”There are usually three to four judges and these judges, will ask them questions about their notebook they sent up earlier, and they will be judged on the notebook and answer to the questions,” Coldiron said. These students said they feel confident that they are ready for the competition and they will do well. They seem to be excited and well prepared, so they could very well do just that. -Look for the second part of this story with the other group and their competition on human trafficking in tomorrow’s edition of the Daily Times.